Implements of torture were in the tallest turret. Photos courtesy BSSRP. Click on images for larger versions or video. Today, the city of Sudak on southern coast of the Crimea is little more than a summer destination for thousands of vacationers. Tourists come from all over Eastern Europe and Russia to swim at its beaches during the day and dance in its discotheques at night. During the Byzantine period, however, it was an important center of trade in the northern Black Sea. A branch of the Silk Road stopped here, and it was here the Italian economic allies of the Byzantine emperor defended their control of the area. And it was during this period that the durable symbol of the city, the fortress that overlooks the Bay of Sudak, was built. One might think in a resort town that offers swimming, dancing, shopping, and even an amusement park, that an old piece of half-forgotten history would be roundly ignored by all but the most interested history buffs. One couldn't be more wrong. The Venetians built the fortress, called the Krepost, when they, favored by the Byzantine Empire, controlled the Black Sea trade to the Mediterranean. When the Genoese replaced the Venetians in imperial regard and economic control, the fortress also changed hands. The Genoese built up the fortress to the formidable structure that survives today. It was from this fortress that witnesses recorded the sinking of a Pisan ship after an aborted attempt by the Pisans to usurp the Genoese pride of place in the Black Sea. Centuries later, underwater archaeologists would excavate a thirteenth-century wreck offshore the nearby town of Novy Svet that matches the surviving descriptions of the ill-fated Pisan vessel. Throughout the centuries, ownership of the Krepost changed hands along with the Crimea. After the Genoese left, the Turks gained control of the area. They left their distinctive stamp on the site as well. The Christian church was given a dome and turned into a mosque. Excavations inside the fortress walls have discovered a series of graves oriented toward the east, toward Mecca. When the Russians defeated the Ottoman Empire and took control of the area, Sudak became a popular vacation spot for the aristocracy and the fortress was an intriguing relic to be explored. During the Soviet period, the fortress was reconstructed to resemble the Genoese period of rule and archaeologists began to piece together the history of the structure. The reconstruction is quite effective because not only does it give an indication of how impressive the fortress must have been during the Genoese period, but it also is easy to tell where the surviving walls end and the reconstructed ones begin. On a rare day away from the site and the camp, we visited Sudak, excited to explore the Krepost and see the excavations that were being conducted by the National University in Kiev. We were joined by both a large number of tourists to Sudak and citizens of the town, coming together to experience history, up close and personal. We entered through the reconstructed forecourt, already crowded with carts selling drinks and trinkets. What we saw when we passed under the massive towers that formed the main gates of the fortress was quite surprising. Right before my eyes, a lovely young woman in spangled red harem pants was thrown over the shoulder of a knight wearing a black and white tabard over glittering armor. He and two companions ran across the dusty plain, carrying the protesting girl all the way to a wooden facsimile of the Sudak fortress. It was only when I heard the guitar riffs screeching out of obscenely large speakers that I realized that this was a performance, an imaginative retelling of some piece of history of which I was ignorant. The story that was being told was fairly simple. Spurred on by the theft of their princess, a group of humble but plucky soldiers laid siege to the wooden fortress. They were repelled by the better armed defending knights, the evil wizard overlord, and his pet dragon, which breathed real fire. Assault after assault was sent against the walls, to no avail. Finally, another band of knights, resplendent in red and blue, marched up to the fortress under the leadership of our hero, the good king. With their cannons, they set the fortress of the evil wizard ablaze. 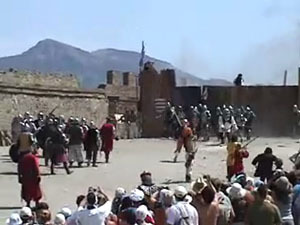 The defending knights emerged and the two sides join in a mock battle. The walls of the fortress echoed back the sounds of the melee; brave war cries, clashing swords, booming cannons. Although I did not recognize most of the players beyond the simple archetypes of good and evil, some more familiar faces caught my eye. Xena, the Warrior Princess, brandished her sword against the evil dragon. The ogre Shrek came to the defense of the fortress, growling and bashing his way through the mob. Even Captain Jack Sparrow sashayed around the edges of the fracas, looking a little confused as to why he was there in the first place. And all the while, the speakers pumped out enough heavy metal music to satisfy even the most ardent headbanger. Alas! The valiant efforts of our heroes were all for naught! One by one, they were overwhelmed by the power of the evil knights, their shining swords falling into the dust. Eventually, the evil wizard emerged triumphant from his fortress. The fate of the beautiful princess was unknown, at least to me. We posed for pictures with all the characters before going on to see the rest of the fortress. One of the good knights, with a Canadian maple leaf on his shield, assured us that they vary the performance so that sometimes the bad guys win and sometimes the good guys win. The rest of our afternoon was spent climbing over the ruins and enjoying the unique blend of archaeology and renaissance fair. We ducked into the tiny museum housed in the church-mosque and saw, to our delight, artifacts from our very own excavations in Novy Svet. 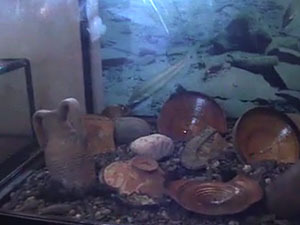 The exhibit was cleverly constructed to look as if the artifacts were still underwater, resting undiscovered on the seabed. We entered the best preserved of the towers to view the royal quarters. Edging out along the walls, we peered between the crenellations and took pictures of the bay of Sudak. We climbed to the tallest turret and came a little too close with some implements of torture. Our group was put into the stocks, decapitated, and branded. I believe that I was sentenced to the iron maiden, an experience I did not care for. We tried our hands at archery in the field below, marveled at smiths at work in a forge, and haggled in a market selling handmade goods. I left the Krepost that evening amazed and bewildered. In all of my previous experience, ruins and monuments such as these were part of an untouchable past, sealed off by velvet ropes and glass. Here they are open to everyone, from the most honored scholars to the most oblivious children. Organic and fascinating, the Krepost Sudaska will assuredly be forever fixed in the memory of all of us who ventured there that day.